September 10, 2015, 7:18 p.m. In the United States there are estimated to be over 11 million people who are living in the country illegally, making up a quarter of the over 41 million foreign-born people who live in the United States. The flow of illegal immigration has slowed in recent years thanks to a weaker American economy, a stronger Mexican economy and difficulties crossing borders but the question of what to do with the millions who are in the United States continues to be a major political issue. While most leading Democrats and some Republicans support offering illegal immigrants a chance to become legal residents, Republican presidential candidate Donald Trump has made the aggressive enforcement of immigration laws one of the key planks of his candidacy. YouGov&apos;s latest research shows that only 33% of Americans actually think that it is possible for immigration agents to find and deport most of the 11 million illegal immigrants who live in the United States. 61% of the public think that it isn&apos;t possible to deport most illegal immigrants. Even 41% of the one-third of Americans who oppose a path to citizenship for illegal immigrants believe that it isn&apos;t possible to deport most of them. 48% of Americans say, however, that they would support it if immigration authorities began to actively search throughout the country for illegal immigrants to deport, even if they have not broken any other laws. 39% of Americans say that they would either &apos;definitely&apos; or &apos;probably&apos; call the authorities on neighbors that they suspect of being illegal immigrants. 41% of Americans say that they &apos;definitely&apos; or &apos;probably&apos; wouldn&apos;t report their neighbors. 50% of Americans say that they would report an employer of illegal immigrants while only 32% say that they wouldn&apos;t.
Asked whether the deportation of most illegal immigrants would help or hurt their family, just under one-third of the country (31%) say that mass deportation would help their family. Only 12% say that it would hurt their family. 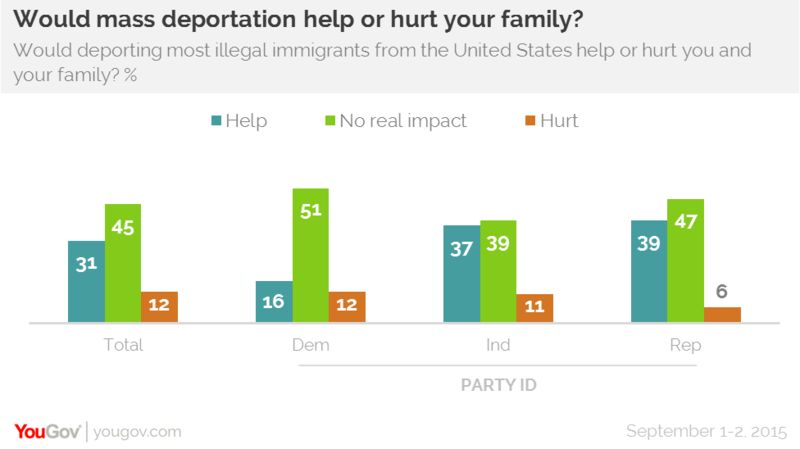 Democrats (16%) are the least likely to say that expelling most illegal immigrants would help them, but over a third of independents (37%) and Republicans (39%) believe that mass deportation would make life better for their family. Just over a quarter (28%) of Americans say that they personally know an illegal immigrant. Hispanics (49%) are the most likely to say that they know an illegal immigrant.